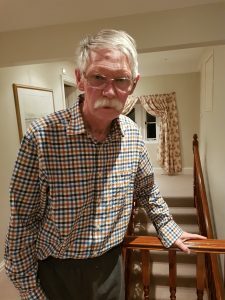 So was a week in a very rural, holiday-let house on the Dorset/Wiltshire border a good idea for a man into whom Ms Alzheimer’s fangs are now deeply embedded? Well, yes and no. Curate’s eggs and the like. We were away all last week, with my (younger) sister, C, and her nonagenarian husband. For most of the time we were also joined by his elder daughter, M, whom I’ve now known for years. What this boiled down to was three chatty, lively, healthy 60+ women and two elderly chaps with very little energy, often confused/irritable or both and in need of a lot of help with things like negotiating steps in an unfamiliar environment. Interesting dynamic and it meant that much of the caring could be shared. Partial respite. Never let its importance be underestimated and grab it when you can. One of the downsides – maybe – was that we did very little. My Loved One and I have always done a fair bit of travelling about to see or do things when we’re on holiday but perhaps I have to accept that those days are over. C and I went for a few good walks and sometimes she strode out with M while I stayed at base. We tootled about a bit making local forays in different combinations – coffee in Tisbury, the very pretty nearest village, or a light lunch in nearby Shaftesbury for example. One day I drove C and MLO to South Dorset for a nostalgia trip to recall childhood holidays. MLO looked mostly pretty bemused whatever we did and wherever we were. We spent a lot of time inside the (very comfortable) house we’d rented, however, not least because of some pretty wet and blustery weather. Thank goodness for newspapers and wifi. C did a big jigsaw. M, who is self employed, found time for some work. I read three novels and also did a bit of writing. We listened to a lot of music, the others watched TV most evenings and it was fun to play violin duets with C, something we don’t get enough opportunities to do. It all meant, of course, that I actually got a bit of a rest which I sorely needed although, as regular readers may have gathered, I am not very good at idling. MLO, meanwhile, takes ever longer to do the most elementary task. I would, while we were away as at home, shower him (literally – like hosing down, say, a car) dress him and then go off downstairs leaving him to put his pullover on. Twenty minutes later I’d go back up to make sure he was OK only to find him just wriggling into the sleeves or wandering puzzled round the bedroom and no sight of the pullover. The nights were very disturbed. Typically, both at home and away, I have to get up three or four times in the night to help him in the bathroom. He’s usually lost in some dream which won’t lift and hasn’t got a clue where he is or what he’s meant to be doing. Again and again last week I’d say to him, in our en suite bathroom “OK job done – back to bed now, please” only for him to stand in the middle of the bathroom unable even to find his way through the bathroom door and into the bedroom. Sometimes he would point questioningly at the bath or the towel rail. I see a bit of this in our own house, where the bathroom is across the landing, but it was much worse in an unfamiliar environment. The most chillingly depressing moment in the whole week came when I was helping MLO to sit down at the breakfast table one morning. He looked me straight in the eye and asked: “Has Susan gone out? Will she be back soon?” That’s a first. And, I suppose, the beginning of a new stage in this horrible, hideous, hateful illness. On the other hand it was very touching (and supportive) to see both C and M being heart-warmingly kind to MLO, taking him by the hand, helping him up from chairs, doing up his seatbelt, making him drinks and a lot more – especially as my brother-in-law really needed to be their top priority. Even MLO commented on how gentle and tender C was with him. “How old was she when I first met her?” I was asked at one point. “Eight” I reminded him. Communication was even worse than usual during the week away, though. MLO seems to be losing oral volume so I often can’t hear him and my very deaf brother-in-law rarely can so it’s hard for the two of them to communicate with each other. Add to that the fact that MLO’s sentences often make no sense anyway and – try as everyone did to be inclusive – conversation tended to be mostly the three of us women discussing our own interests, concerns and preoccupations with each other rather than with either man. And as for food, well we kept it casual and low key, more or less taking it in turns to sort dinner. 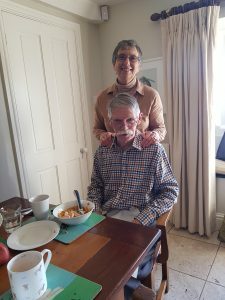 Lots of options seemed to be the way forward especially as MLO and I have been vegetarian for 40 years but Brother-in-Law, while enjoying eggs on toast and jacket potatoes, is noticeably suspicious of anything relating to the V-word. So was it a success and would I do it again? Yes and yes. I suspect it’s about the best I’m going to get on the holiday front for the forseeable future and the opportunity to relax was very welcome. So was all that chat because I’m somewhat short, these days, of ordinary conversation at home. Wish I’d been able to spend more time out in lovely Dorset but I’ve seen most of it many times before and in my situation you have to make the best of compromises.